Presidential Adviser on the Peace Process Jesus G. Dureza previously headed the government peace office from January 2006 to June 2008. 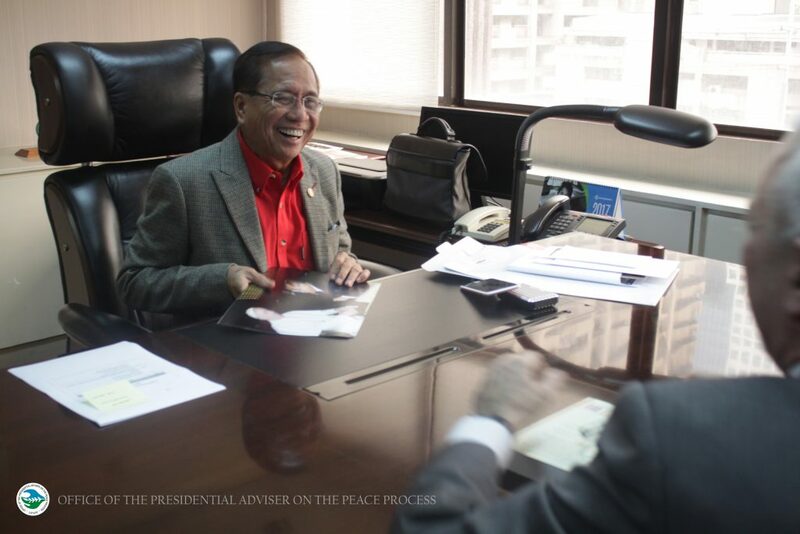 Prior to his stint as peace adviser, Dureza has been a recognized personality in peace and development who was known in taking part in the two most challenging peace tables. He chaired the government negotiating panel on the resumption of talks with the Moro Islamic Liberation Front from February 2001 to May 2003. He also served in the government panel on negotiations with the communist groups as adviser and spokesperson. As an Ilonggo native who grew up in Davao City, a progressive Mindanao has been in the forefront of his peace and development advocacy. He held several government positions that advocated Mindanao’s strategic development. He was appointed twice as the point person of Mindanao under the Office of the President – first as Presidential Assistant for Mindanao in 1998 and second as Presidential Adviser on Mindanao in 2009. He led for two terms the Mindanao Economic Development Council in 1998 and in 2001. In 2006, he was named as the Development Champion of the envisioned Mindanao Super Region. Later on, he presided the newly-formed Mindanao Development Authority in 2010. As the chairperson of Mindanao Development Authority, he ensured the participation of Mindanao and Palawan in the Brunei, Indonesia, Malaysia, Philippines – East Asian Growth Area (BIMP-EAGA). Dureza represented the country in the treaty signing of this strategic alliance between the four southeast Asian nations. Even without a government designation, he still championed Mindanao’s sustainable peace and progress. He was the founding chairman, president and chief executive officer of Advocacy Mindanow Foundation, Inc.. He was the national programme director of Action for Conflict Transformation (ACT) for Peace Programme under the United Nations Development Programme. He was also the chairperson of the peace and development group, Advocacy Mindanao. Aside from holding vital posts to uplift the welfare of Mindanaoans, he served in several government capacities since 1989. He was elected twice as representative of Davao City to the Philippine Congress in 1987 and in 1992. He was part of the governing board of the Philippine Coconut Authority from 1989 to 1992. He held various posts under the Office of the President from 2006 to 2009 – as presidential peace adviser from January 2006 to June 2008, as press secretary from June 2008 to January 2009, and as chief presidential legal counsel from February to June 2009. Before embarking into public service, Dureza is a veteran journalist and a lawyer. He was the former publisher of Mindanao Times – the oldest newspaper in Mindanao. He also headed several media affiliations including the Philippine Press Institute, the regional chapter of the Publisher Association of the Philippines, and the Davao Press Club. Dureza was a senior partner in the Rama-Dureza-Abarquez Law Firm. He earned his Bachelor of Laws degree at the Ateneo de Davao University. In 1973, he ranked 10th place in the Bar examinations. Before entering the public service, he was elected president of the Integrated Bar of the Philippines chapter in Davao del Sur in 1985 to 1987. Dureza has been also actively involved in different civic, academic and business engagements in Davao City and Mindanao. He was the vice president for Mindanao of the international civic organization Philippine JCI Senate from 2013 to 2014. He was a trustee in the Davao Verbum Dei Media Foundation Inc. under the Archdiocese of Davao. He also taught as a law professor in the Ateneo de Davao University and served as a member of the University of Mindanao Board of Trustees. He was elected as the president of the Federation of Rural Bankers Association of Davao and presided the city’s Consumer Movement. In 1998, former President Fidel Ramos awarded to him the Presidential Award of Merit. He also received the Datu Bago Awards, the highest recognition given to an outstanding Davaoeño.